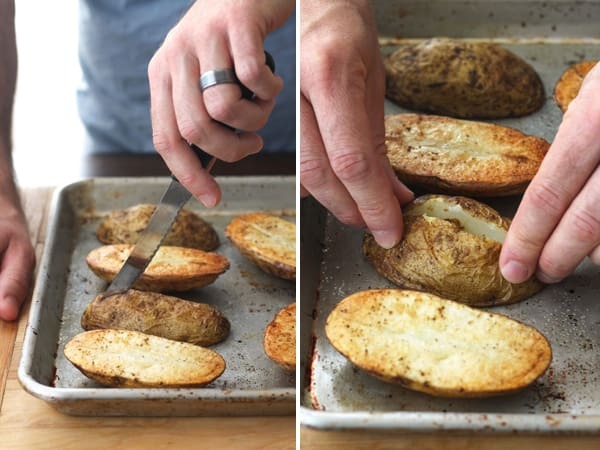 A quicker method for baking potatoes that are crispy, fluffy, and perfect for loading up with your favorite baked potato toppings. 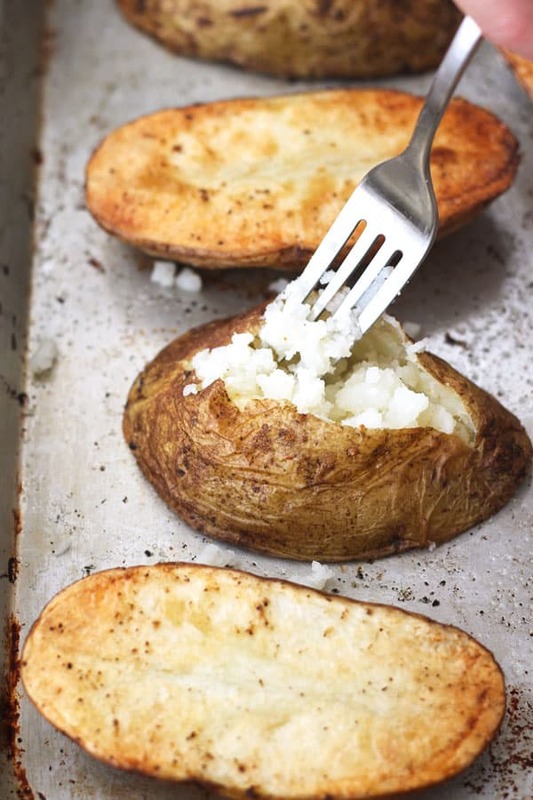 There’s really nothing better than a freshly baked potato right? From the crispy skin to the fluffy flesh, it’s just so darn comforting. But man if it doesn’t take FOREVER to bake a potato. Sure, you can shortcut it with the microwave but they’re just not the same. The potato skins end up papery and dry while the flesh gets gluey and dense. After discovering a method for cooking quick baked sweet potatoes, I was dying to try it with regular baked potatoes too. It’s pretty much like our classic toaster oven baked potato. 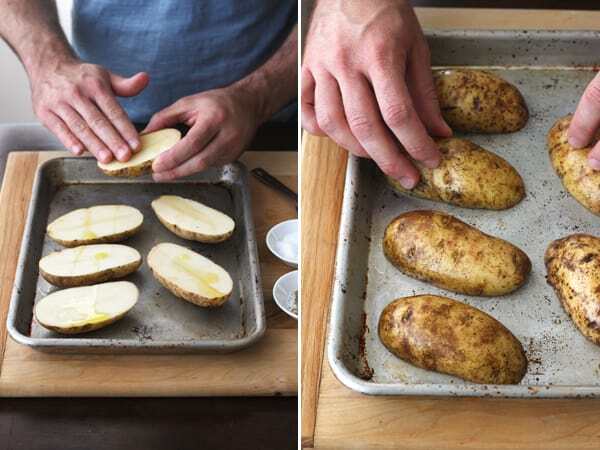 Except you only need a baking sheet and instead of cooking your potatoes whole, you slice them in half lengthwise! Smaller spuds take about 25 to 30 minutes while larger ones (like the 13 oz one pictured above) will run you 35 to 40 minutes. The result is heavenly, a perfect marriage of crispy roasted potato wedges and fluffy baked potatoes. The skin is crisp and way better than the microwave but it’s not near as crispy as the skin on a traditional baked potato. You still have to fluff the potatoes after cooking to let the moisture out or they will become dense. 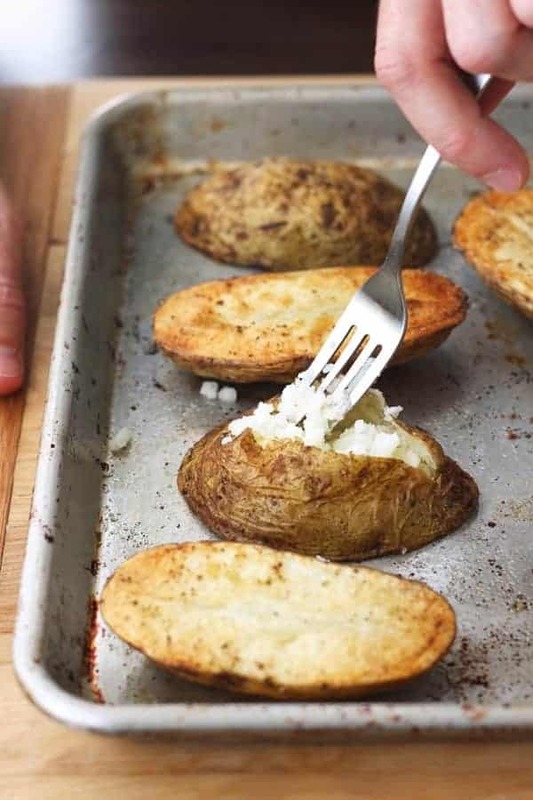 If you skip the fluffing, the halves are great for scooping out and making potato skins! 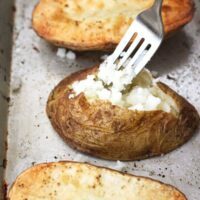 A quicker method for baking fluffy potatoes that are perfect for loading up with your favorite toppings. 1. Adjust the cooking rack in your toaster oven (or oven) to the lowest position and preheat to 400°F on the “Bake” setting. 3. Stab the potatoes with a fork 2 or 3 times on each side. Then slice them in half lengthwise. 4. Place the potatoes on the prepared pan and drizzle with oil. Use your hands to rub both sides of the potatoes well with the oil. Season the flesh with salt and pepper. 5. Arrange the potatoes halves with the flesh facing the pan. Sprinkle the skins with salt if desired. 6. 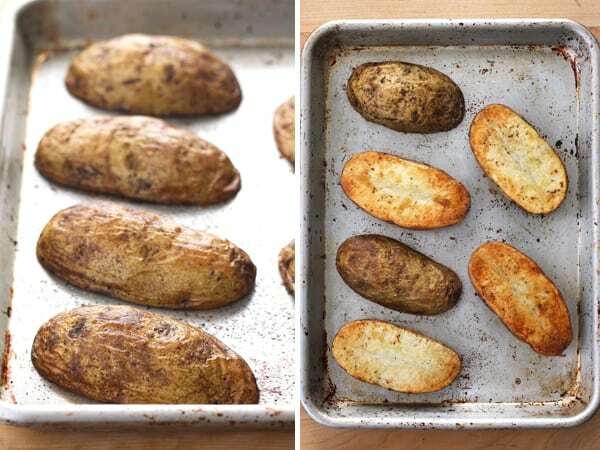 Bake until the potatoes are tender and the skins are dry and golden, about 25 to 40 minutes depending on the size of your potatoes. 7. Cool the potatoes slightly, then use a spatula to transfer to a plate. Slice a thin strip off the top of each potato and fluff the flesh with a fork. 8. Season, add your favorite toppings and enjoy! Cooking With Convection: Keep the temperature at 400°F and begin checking for doneness after 20 minutes, adding more time as needed. All of the convection batches we’ve baked have taken the same amount of time as the batches cooked with convectional heat. The only difference was the convection ones had crispier skins. Oil-Free: Omit the oil and line your pan with a silicone baking mat. The flesh facing the baking mat may stick a little. 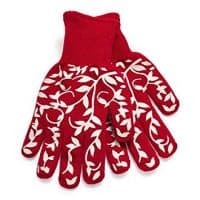 If that happens, leave the potatoes to cool for 5 minutes, then peel them off with your hands. Leftovers: Promptly refrigerate any extra cooked potatoes in a covered container and store up to 3 days. Start by adjusting the cooking rack in your toaster oven, traditional oven or countertop oven to the lowest position and preheat to 400°F. 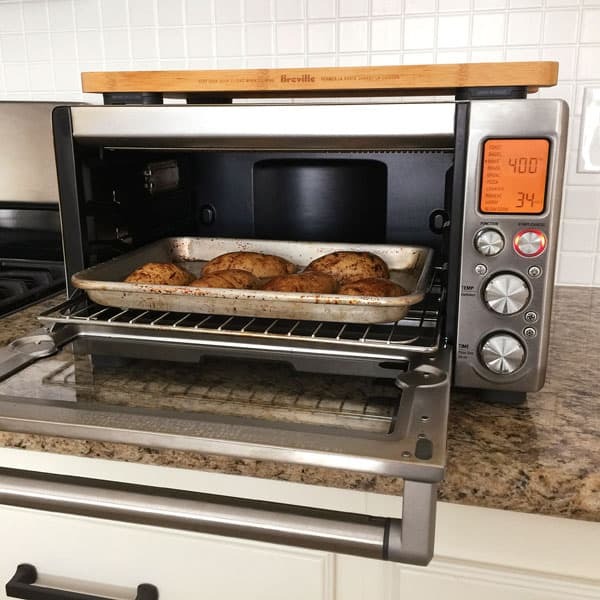 If you’re using a toaster oven or countertop oven make sure it’s on the “Bake” setting. Next, stab the potatoes with a fork 2 or 3 times on each side and then slice them in half lengthwise. 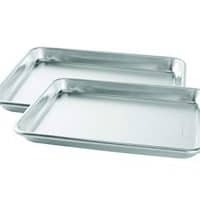 Grab a baking pan that’s sized to fit the oven you’re using. 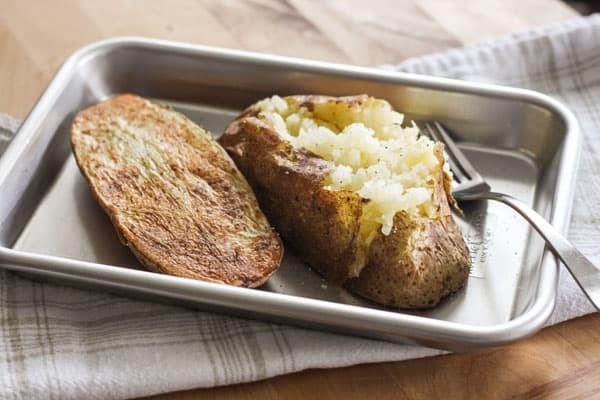 We usually bake potatoes in our Breville Smart Oven Pro with our trusty quarter sheet pan. Lightly oil your pan or line it with a silicone baking mat. Then place the potato halves on the pan with the flesh facing up. Drizzle the potatoes with the oil and use your hands to coat both sides of the potatoes. Season the flesh with salt and pepper. Next, flip the potatoes over so the flesh is facing the pan. At this point, we like to sprinkle the skins with a little salt. It gives them a yummy french fry taste. Bake the potatoes at 400°F until they are fork tender and the skins are golden. This will take about 25 to 40 minutes depending on the size of your potatoes. Most weeks we buy our potatoes in those convenient 5 lb sacks. Sack potatoes are generally small to medium sized – about 5 to 7 ounces. They take 25 to 30 minutes to bake up. A beastly 13 oz potato I tried was fork tender at about 35 minutes but I let it bake for an additional 5 minutes just to be sure. Once your potato halves are ready, cool them slightly and then use a spatula to release them from the pan if needed. 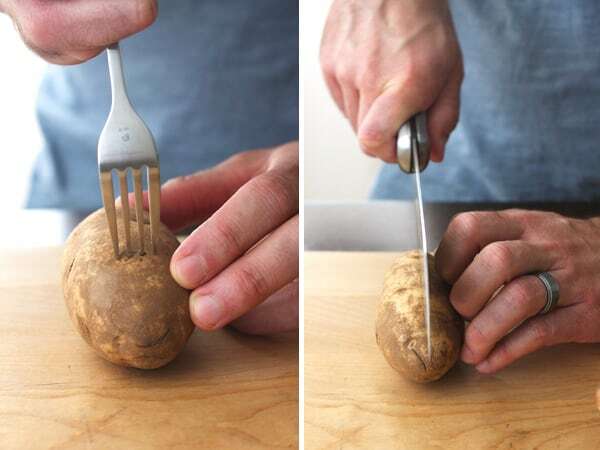 Use a steak knife to cut a line across the top of the potato. For the smaller ones watch how deep you slice, it’s easy to cut all the way to the bottom. Place your fingers at each end of the potato and press the ends towards each other. The potato will pop open and you can fluff the flesh with a fork. BUT…while testing a batch made with no-oil I had a total duh moment. 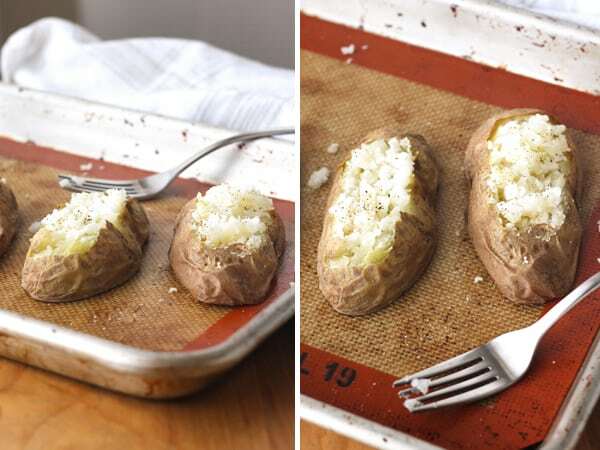 With the smaller baked potatoes, it’s way easier to slice a small strip of skin off the top of the potato and then fluff it. This way you don’t accidentally cut through to the bottom. Which is something we did more than a few times with the other method. Plus, it gives you more surface area for holding toppings. And let’s be honest, more toppings is never a bad thing! I think your new format is great. Small amount of food for two with no leftovers. I’ve kind of let my toaster oven sulk for a while as I explored my new 3 qt. InstantPot but each appliance has it’s place. The wee TO uses less electricity and space than the conventional standing oven. I like the browning and crisping aspect of the TO. I’d love some more bite-sized hot appetizer recipes. Stay calm, carry on…and know your endeavours are appreciated! I’ve been thinking about getting an IP but have been putting it off for fear of having to learn another new appliance. But with the colder months ahead, curries and soups are sounding better and better. My mom’s actually visiting this weekend and bringing her 3 qt. IP so we can play with it. If you’ve got any favorite recipes to share, please send them my way! Hot appetizers are genius, especially with all of the holidays coming up – we’ll definitely work to add more of those to the site. Thanks so much for stopping by and taking the time to comment. It’s always nice to hear from you!